Peralta, the youthful military officer who initiated the project, said he saw the plight of the CAFGU members under him and thought of helping them earn additional income for their families. “Ang aim nito is to help the community especially those volunteer soldiers. Wala rin namang magha-hire sa kanila kasi hindi rin naman dire-direcho trabaho nila considering na ngdyu-duty rin sila voluntarily”, Peralta said. Seeing the vast idle area surrounding their camp, Lt. Peralta thought it would be nice to utilize the area to help the CAFGUs. He contacted the owner and told him of his plans, which the owner gladly permitted. “The owner is now in abroad so there is no way he can look for his property. He also learned that the expansion of a Muslim cemetery encroaches in his property, so he gave us the go signal to utilize the lot and safeguard it”, Peralta said. The project started in July of last year where they maintain 15 workers. But as of recent, civilians around the area have also joined the project. “We maintain 15 workers but during peak season, many civilians are also involved”, Peralta said as he talked on the community’s involvement in the project. He also emphasized that the total proceeds of the farm go to the workers. “Hindi kami kumukuha ng share sa benta. Napupunta sa lahat ng workers. Para sa kanila lahat ng yun”. (We don’t get any shares from the proceeds. Everything goes to the workers). Peralta thanked the City Agriculturist’s Office for their invaluable support to the project. “The Office of the City Agriculture (OCA) provides us with all our seedlings and even organic fertilizers, although we also spend for the fertilizers, specifically non-organic fertilizers”, he said. As of their last harvest, they have earned P40,000.00 in sales. They are now replanting the area with the help of OCA. “So far we 3,500 hills of eggplants, with 10,000 hills of tomatoes about to be planted. We also have five kilos of sweet corn seeds also to be planted. We are targeting to maintain 10,000 hills of tomatoes for continuous harvest”, Peralta said. 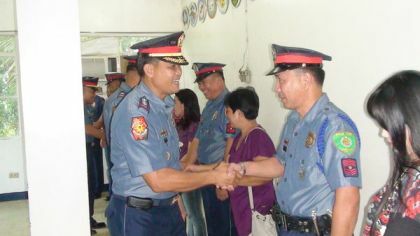 Mr. Catalino Barrera, one of the beneficiaries of the program, thanked Lt. Peralta for initiating the project. “This project has really helped me and my family. I now have a job that will feed my family”, Mr. Barrera said. Barrera joined the project last October and is currently overlooking the whole farm. “I don’t need to waste futile efforts to look for a job. My family will not starve and, what’s important is, our child can now go to school. Indeed, this is a big help for us”, Barrera said. Lt. Peralta said he is looking to sustain the project thru inter-agency partnership. “As part of our future plans, we will be coordinating with the Department of Labor and Employment (DOLE) to help us form a cooperative for our farmers, of course, with the supervision of the Office of the City Agriculture”, he pointed. He called on the families of the CAFGUs and the civilians in the area to continue to help them sustain the project. “You are my inspiration for this project. Please help me sustain our project for our community”, he stressed. Mr. Robinson Sahidul of OCA, in turn, committed the full support of the project and envisioned Barangay Mampang as major vegetable producer in the city. “We will extend all necessary efforts to make sure that this project prospers. Whatever we can do, we will gladly help you. We want to see Mampang become the vegetable basket of Zamboanga City”, Sahidul said. This kind of project is what the national government wants to realize under the Internal Peace and Security Plan (IPSP) of the Armed Forces of the Philippines called “BAYANIHAN”.